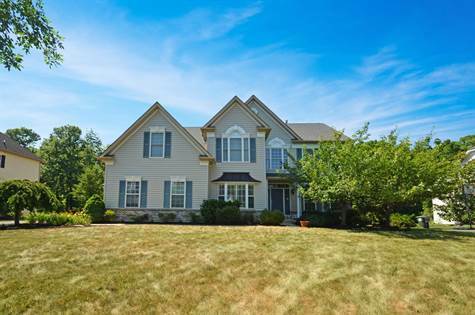 "Trade up to this home and we will buy yours" 4 BR, 2.5 bath, colonial nestled on a quiet cul-de-sac in the award-winning Central Bucks School District, just minutes from downtown Doylestown. Custom tiled foyer greets you as you step into this impeccably cared for home. Enjoy the modern touches w/ 9' ceilings, crown molding, & numerous upgrades throughout: floor to ceiling windows in the FR w/ wood fireplace; grandiose vaulted ceiling in the FR w/ rear staircase giving nice vistas of the outdoors for all seasons. Enjoy cooking in spacious kitchen w/ granite island & plenty of counter space & cabinets.. 2nd floor features 4 BRs: 2 carpeted 2 hardwood. Master BR complete w/tray ceiling w/ remote controlled ceiling fan, sitting room w/ vaulted ceiling, walk-in closet & full bath with imported Italian tiling around large oval tub & enclosed shower. Full basement offers ample storage & potential. Private backyard w/ one of the best views in the neighborhood! 1 year home warranty included.